Here is another exciting book that will hit the bookshops early September 2016. 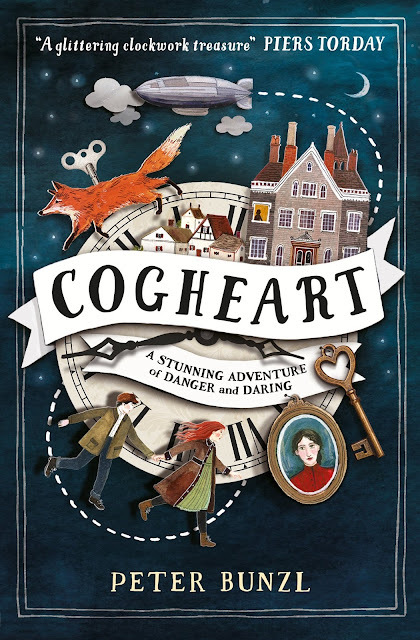 Peter Bunzl's debut title 'Cogheart' will be published by Usborne displaying a brilliantly striking image. The quirky and delightful cover illustration has been created by Becca Stadlander and cleverly designed by Katherine Millichope. It is one of my favourites and, in my opinion, appeals to all readers of all ages. This is an enchanting read from the very first page. It is a Victorian tale that will deliver a massive helping of immersive imagination. After reading a non-fiction book called Living Dolls by Gaby Wood, the author was inspired and a seed was planted about automatons. The book provides many thought provoking questions about independent thinking and feelings from the perspective of mechanical robots. This adventure is filled with automata characters that you will really take to your heart. The mechanical animals and the house servants are a great work of creative imagination. They are a key success to the clockwork beating heart of this book. Peter has done a fabulous job building a fantastical fantasy world that you will truly get wrapped up in. He's unlocked and turned the winding key of his imagination and put it down on paper in a mechanical heartbeat of passion. You'll laugh with the cantankerous clockwork fox called Malkin, who has lots of personality and very opinionated. You will also cry with the main character Lily (heroine) and feel her pain and heartache along this deadly adventure of intrigue. You might find some parts of the plot a little stilted in places, as perhaps more action/back story needed at some points, in my opinion. However, with that said, the story creativity is very strong and certainly strong enough to make this book a really enjoyable read. In places this story feels deliciously gruesome, which I personally love as a reader. Some characters do die in a rather hideous way, but I will say no more. The book has a massive dollop of mystery that will keep you on your reading toes throughout. At the moment I haven't been reading many steampunk adventure books like this, which are fuelled by murder and some very nasty bad guys. I really enjoyed the European flavour that crept in at times. This is a classic action adventure, with many film-like qualities. It is a promising start to a great new series, and one that I would certainly recommend to read. With the sequel already poised, this is an absolute cracker from a new voice in town.